A zero-emission heavy-duty truck that hauls more than 36,000 kg of cargo. Japanese automaker Toyota is serious about perfecting hydrogen fuel cell technology to power its vehicles, and it’s scheduled an initial feasibility study operations for its zero-emissions heavy-duty truck a little over a week from today. 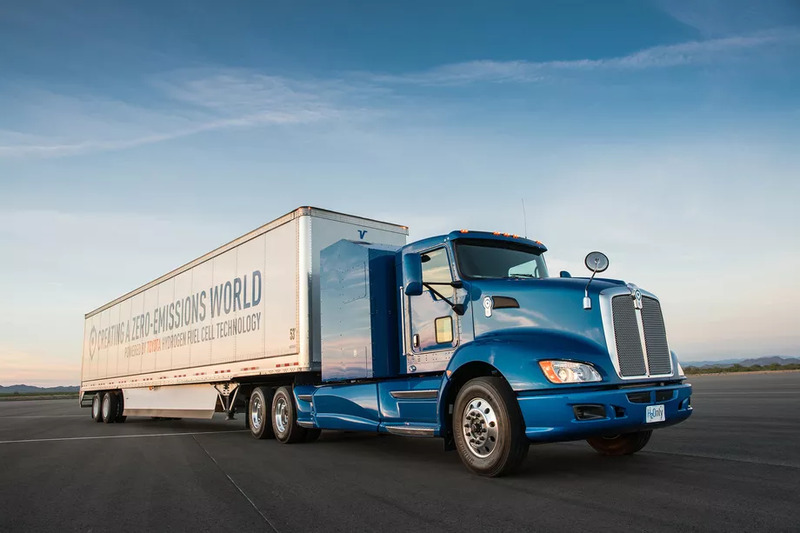 A concept version of a truck running Toyota’s specialized hydrogen fuel cell system designed for heavy-hauling use will be moving goods from select terminals at the Port of LA and Long Beach to nearby warehouses and rail yards beginning on October 23. “If you see a big-rig driving around the Ports of Los Angeles and Long Beach that seems oddly quiet and quick, do not be alarmed! It’s just the future,” Toyota wrote in a press release. The company expects the daily runs to cover some 322 kilometers (200 miles) to test the fuel cell system’s duty-cycle capabilities. Afterwards, longer trips could be introduced. According to Toyota, this zero-emissions heavy-duty proof-of-concept truck has already covered roughly 6,437 kilometers (4,000 miles) in development tests, where it pulled a progressive weight of cargo — 36,287 kilograms (80,000 pounds) tops — while only emitting water vapor. It packs a 670 horsepower, with 1,325 pound-feet of torque, from two Mirai fuel cell stacks combined with a 12kWh battery. Hydrogen fuel cell technology has been around for a while now, but its commercial use has remained rather limited. Compared to their electric vehicle cousins, hydrogen fuel cell cars are more expensive to manufacture. There has been development on using more cost-efficient materials, however. Meanwhile, Toyota’s long been taking the lead in hydrogen fuel technology, and they plan to build a fleet of hydrogen-powered trucks. Following behind Toyota is Japanese car maker Honda, which also has plans for a hydrogen-powered car, as well as EVs and hybrids. Mercedes-Benz is also getting in on the hydrogen fuel scene. In short, more and more car makers are seeing the value of zero-emission vehicles — be it hydrogen-powered or the more popular battery-powered electric cars. They’re paving the way to fossil-fuel-free roads.